James Norbury is a quiet writer who moves to London at the end of the nineteenth century. While his estate is in shambles after the death of his father, he manages to secure rooms with a wealthy aristocrat named Christopher Howland. James begins to feel at home in the big city as he finds inspiration for his writing and love in an unexpected place. But as quickly as James arrived in London, he disappears without a trace. His sister Charlotte embarks on a journey to find him. Her discoveries about the darker corners of London and particularly the mysterious Aegolius Club will shock her and change the path of James and Charlotte's lives. There is a great deal of mystery around the plot of this story and I will do my best to maintain that. Suffice it to say that there is more than there seems to the characters in The Quick. Ms. Owen does a brilliant job of creating an atmosphere of darkness and fear, where unknown monsters could lurk around any corner on any night. This story is also a study in shades of grey, as we encounter villains who think they are serving noble causes and heroes who wonder how long they can battle evil without losing their humanity. The main characters are well developed in this story, particularly the pair of siblings. When James disappears, the events that transpire are shocking for the reader and hard to handle because we have come to care so much for James and the people he loves. Charlotte is determined to find her brother regardless of the cost and readers will empathize with her love for her brother and refusal to give up. It's wonderful to read a story where the main bond is the one between siblings instead of a romantic tryst. This book jumps around quite often in time and perspective. It seems too long in places, especially as the we follow James and Charlotte through their privileged but lonely childhood and again as Ms. Owen wraps up loose ends at the end of the story. While the narrative is often from the point of view of James or Charlotte, there was another narrative that I found jarring and ultimately unnecessary. This character is privy to the secrets of the Aegolius Club and recounts his findings through a journal which is ripped and fragmented. Reading "a page is missing here" or "writing is smudged and illegible" over and over again becomes annoying after a time. Ultimately, I wish we had spent more time with fewer characters. 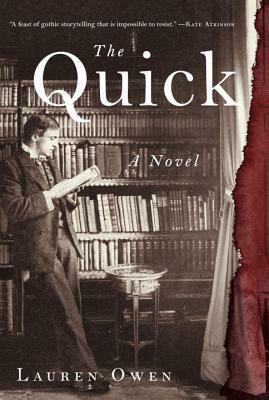 The Quick is a scary story wrapped in a tale of familial love at the end of 19th century London. This debut novel will pull you in with its pitch perfect atmosphere and keep you turning pages with a fast-paced race through the dark and dangerous streets of London. While it may be a bit too long, it is the perfect read to race through during a summer weekend or to savor with a mug of hot cider on a cool and creepy fall evening. I've seen so many conflicting opinions of this one, that just means I have to read it myself! I agree. Seems like everyone is mixed. I have to confess that I don't read a lot of creepy stories but I liked a lot of things about this book. It's so interesting to read so many opinions about the same book, isn't it? I love the setting (you can't get better than 19th Century London! ), but I think this novel is a little too dark for me! I don't read too many scary books because I get freaked out easily. This one was really atmospheric without making me peer around corners at night! I could not agree with this review more. Especially that journal narrative. I found in the end we were so far from where we started. The ending was pretty great though. I liked a lot of it but there was just too much - too many pages and too many narratives. I'm with Andi. I've seen so many varying reviews, I'll have no idea what to think of this one until I've read it myself! Isn't that the funny thing about reading other reviews? Sometimes you just have to take the plunge! I usually find myself pleasantly surprised.